Happy Monday! Did you Americans have a good Mother's Day yesterday? I certainly did! I really slept in, then my cute little family brought me breakfast in bed with a side of cards and presents. Then Nick did double duty with the kids for the rest of the day (including making a gorgeous dinner!) so I really felt pampered and special. I hope your day was lovely too, regardless of your mothering status. Oh, and did you see this? So, I thought I'd continue the house tour I'm doing and show you the guest room in its current state. I try really hard not to fuss and style and stage too much when I take these house tour shots, but rather think of them as giving a visiting friend a personal tour of the house. So bear in mind that all of these rooms are actual rooms that our family lives in, rather than something gorgeously styled for a photo shoot. It's kind of a funky little room with its slanted ceilings, big window and relatively small foot print, so we went with a similarly funky color scheme of yellow and teal/turquoise which (I think!) works well with the greige walls and browny grey trim (Benjamin Moore's Sparrow, if you were wondering). I feel like it's bright, fun and welcoming, as well as a good balance of masculine and feminine, so everyone should feel fairly at home. Because the colors are pretty bright, we've been able to go with some fairly fun furnishings too, like the two mismatched teal nightstands and the even more mismatched lamps on top of them. It was quite the hunt to track down two cute lamps in the colors we wanted for a price we were willing to pay (why are lamps so expensive? Why? ), so I was pretty happy when we found those two, especially the yellow one which just makes my heart happy. It's just so happy! There's also a teal trash that didn't make it into the pictures, but you can see it here. We paired all the bright colors with some solid dark wood bookshelves in an attempt to ground the room a little so it doesn't completely go off into lala-land. I really like how the dark brown wood looks with the teal especially. The framed picture on the right of the picture above ties all the colors together nicely. Give your guests as much space for themselves and their stuff so they don't feel like they're in the way. In our guest room that means that there is space in the closet for them to hang their clothes and stash a suitcase, as well as an empty nightstand. We also keep a luggage rack behind the door for guests to put a bag or suitcase on. Blackout shades. No one really wants to be woken up by the sun streaming through their window at 6:30 or kept awake by passing cars. Ours are also easy to operate and can let in light at the top or the bottom while still allowing privacy. A floor fan. For some reason our guest room is the warmest room in the house, so it's nice to know that guests can cool off if necessary. I also keep a stack of blankets in the closet in case they feel cold. I keep a set of teal towels (not pictured, because they are currently in the washing machine) that are exclusively used by guests. No one else in our family has towels that color, and because they visually tie into the guest room guests can feel confident that they are theirs. Towel ownership ambiguity is never good. I think it's nice to give guests something to do in their room, so we keep a couple of bookshelves in there with a pretty broad variety of books, including a couple of local guide books to give them an idea of what they might like to see while they're in town. A few magazines on the nightstand are nice too. Their own trash can. It's nice if they know where they can empty it too. Some things you just don't need your host to know about! I'm still on the lookout for a good one for our guest room, but a mirror is always nice. A little dish or tray for corralling jewelry, change, etc. And for extra special guests (like my mum) I like to add some fresh flowers and a treat like a little candy dish. NOT like camping. So that's our guest room! It still needs a few touches like that mirror I mentioned, and a headboard for crying out loud (I like this one from World Market, but don't want to spend the money. It shouldn't be too hard to recreate, right? ), as well as some curtains and a bit more art on the walls, but other than that, it's a pretty comfy little spot for a few friends to relax. Yellow duvet, teal nightstand, teal cart (really a kitchen cart, but we used it as a nightstand), and trash can from IKEA. 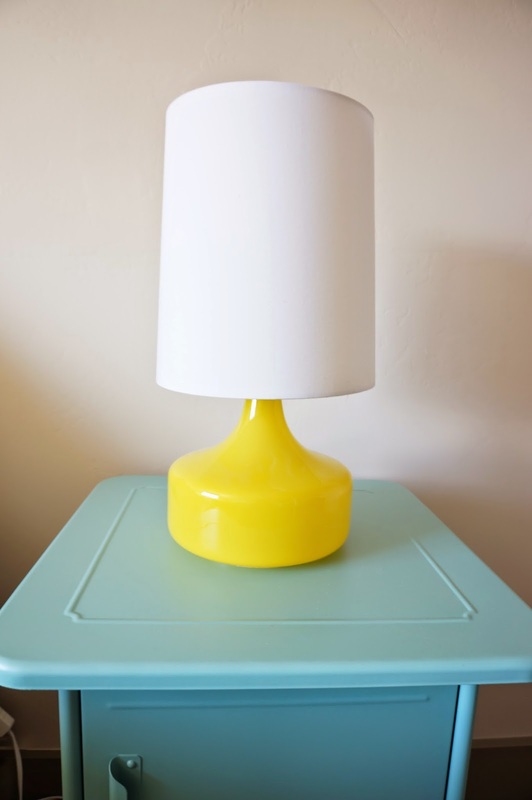 Yellow lamp from West Elm. 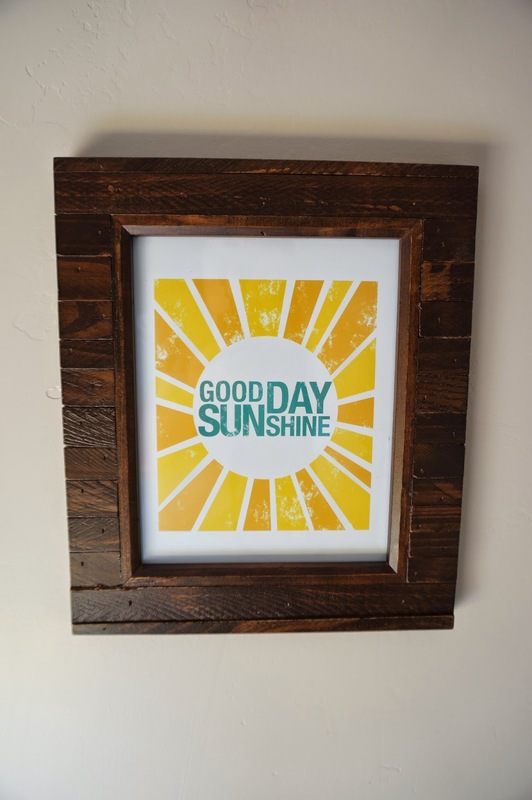 Good day Sunshine print. Nick made ours, but this one from koart design is verrry similar. Wood picture frame from Michael's. They only have it in black on their website, but we found it in brown in the store. Faux leather folding chair from Bed Bath and Beyond. um, adorable. I love the bright colors and also that it doesn't "go off into lala land." ha!